@Haru17 unless the rumours of the starters having multiple final evolutions are true. Like @DeweyDTruman says always wait for official announcements/art before coming to conclusions. As for my team I more of the having 10+ Pokemon on the go and switching them out of my main 6 as and when I feel like it type of player. Between new Pokemon, new forms, Z-Moves and I'm presuming new Megas I'm going to be juggling a lot of Mons! Experience the Z-Ring for Real on Your Own Arm! Tomy International will be releasing a Z-Ring item for sale, timed to match up with the launch of Pokémon Sun and Pokémon Moon. When a player uses a Z-Move in Pokémon Sun and Pokémon Moon, his or her real-life Z-Ring will light up, vibrate, and play sounds to go along with the video and sounds in the game. With this new experience, players will feel the force of these overwhelming Z-Moves with even more realism! Please look forward to more details about the Z-Ring to come from Tomy International. I can't wait to draw even more strange looks my way on my commute as I add another piece to my Pokemon Training gear! 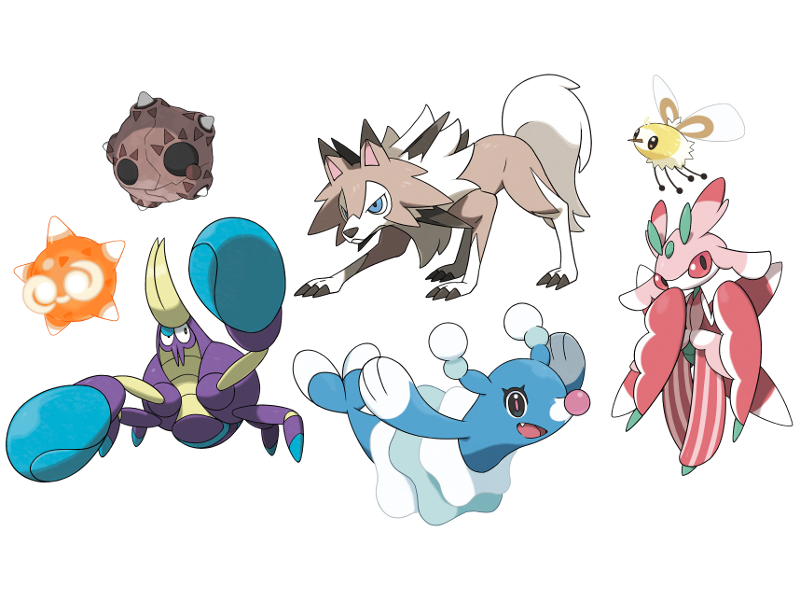 I wouldn't bet on new megas. Gen 4 was new evolutions to previous pokemon, gen 5 all new pokemon, gen 6 (& ORAS) mega evolutions to previous pokemon, and gen 7 seems to be going for the regional variants. These aren't treated as forms, but rather as new pokemon species. Just like how there's different species of robin, there's different species of Ninetails, etc. I could be wrong of course, but I think we'd have seen a mega by now. I'd assume megas would get their own trailer. (Maybe the one later this month?) It would be odd for them to completely ditch an established and popular mechanic. Thing is though, megas, new evolutions, and subspecies all fill the same role of "old pokemon, new designs." Maybe I'm just rooting for an alternative to megas because holding the item and pressing the button and watching the animation is a bit clumsy to me, Idunno. It is weird that gen 7 is getting the "Z" push, though. I wonder what will come of it. Now we have Z-Moves, which is holding the item, pressing the button, and watching the animation 2.0. Least it seems better for the meta, and it doesn't ruin Pokemon in the way Mega Evolutions potentially did if something had a crappy mega and really needed a proper evolution. So far my team is Popplio of course, Rockruff, Cutiefly or Wimpod, Mimikyu, Minior, and Lurantis. The rumors about Rockruff turning into a werewolf thing sound rad. I still need to see Cutiefly and Wimpod's evos to decide which I'd rather use. The rest are pretty locked in unless something really awesome comes along and justifies me knocking them off my team. Probably won't ditch Minior, because I still regret not boxing my Aurorus for Carbink in XY. Tried to make Aurorus work so hard, but that typing was just a death sentence. @Mbun I take your point. We'll have to see how Z-moves work out. I'm hopeful, because not only do the animations look waaaaay better than megas (lazy powerup effects, encased in a shell, yaaaay: they break out and roar with this rando symbol above their heads that's never explained), but they're adding something that basically all other turn-based games already have: Supers. Special attacks are just useful to break up the monotony of combat, especially since most pokemon don't have unique or even rare moves. Hell, even Monster Hunter benefited from supers, and that game has a real time combat system. Anyway, I'm really hyped on Rockruff, since I learned he was a secret werewolf, too! I just hope the design is good. I also tried to run Aurorus in X, but gave up after a few levels because it was just such a glass canon (same reason I ditched my Chesnaught). I also really wonder how/if Minior will evolve. I've been missing these kind of spacey pokemon since Solrock/Lunatone, Metagross, & Deoxys. @Haru17 I think I had to use some weird Calm Mind moveset to pump up Aurorus and carry it through the E4 if I remember right, but I somehow managed to do it. Wish the website thing showed off how my Florges was shiny. I randomly picked up a shiny Flabebe on one of the first routes. Has planned to use Slurpuff instead, but that kind of decided for me. I kinda like to do a Nuzlocke-style of picking my team. I was never a huge fan of picking someone because they are "good". I'd rather pick up the guys that I am excited to run into through serendipity. New concept for an Alola team: pretty bois. I definitely want Mimikyu on my team. Even if it's evolve is terrible, then I'll everstone it/refuse to let it evolve. It's the only fairy pokemon I've liked so far. Sandlit has cool typings. Fire poison? Heck yes. But if it's evolves look weird, I may cut it. Rowlett will be my starter. I can have a whole team of Litten right? Settled on this team for now. Might adjust if something I can't ignore comes along. @Mbun Twist: That bug's final evolution is fire / fighting type. When I play Pokemon, I don't want to strategise, and plan things ahead of time, like what will be my pokemon team etc. I want to play, and see what works and what doesn't. But that said, I will hunt down and get Alolan Ninetails. Because "regular" Ninetails is great in my opinion, I think Alolan version will be something glorious. @Haru17 Cutiefly? That'd be quite the twist, since right now it's Bug/Fairy. Unless you meant Lurantis, which isn't a bug at all, and I'm pretty sure that's the final form of it. My team is lacking fire right now though and has an extra Rock Type. @jipostus I mean, this is just in-game team. It's not really about strategy for me, just using my favorites. I only hesitate if I'll end up with like four water types, at which point I usually just make a monowater team instead since I'm so far in that direction anyways. It's fun to just pick favorites and then try and make them work even if they're not the most optimized team possible. I play Pokemon like a blue/green deck. @Haru17 So recovery moves and stall hijinks? That's terribly slow for the main adventure. I couldn't stomach it.